In SAP Fiori 2.0, the SAP Belize theme is introduced and supplants the SAP Blue Crystal theme as the default theme in the SAP Fiori launchpad and for SAP Fiori apps. However, the SAP Belize theme is not released for SAP Fiori 1.0. Thus, I have created this guide to show you can create the SAP Belize theme for SAP Fiori 1.0 by using the SAP UI Theme Designer. There are two versions of the SAP Belize theme; one is “light” and the other is “dark”. And when it comes to creating the theme, the procedure is the same, except that the color values are different. This guide will show how to create the “light” version of the theme. Also, please note that custom CSS code is used to create the theme and although custom CSS code in the SAP UI Theme Designer is a feature and may work on the theme, it is not officially supported by SAP. Go to SAP UI Theme Designer by launching tcode /n/ui5/theme_designer from the SAP GUI or open your favorite browser (Google Chrome is used in this guide) and launch <server>:<port>/sap/bc/theming/theme-designer/index.html?sap-client=XYZ. Log in if necessary. Select the SAP Blue Crystal theme and then click the Open button. On the right-hand menu, Expert mode. As you can see, creating the SAP Belize theme in SAP UI Theme Designer is pretty straight forward once you know what to do. However, what took the most amount of time during the initial development of the theme was figuring out which CSS classes and styles to target, which was accomplished by using Google Chrome’s developer tools on the SAP Fiori launchpad and making changes to the DOM on-the-fly in order to see whether I had modified the correct class. Definitely would be interested in the code to reset the personalization. 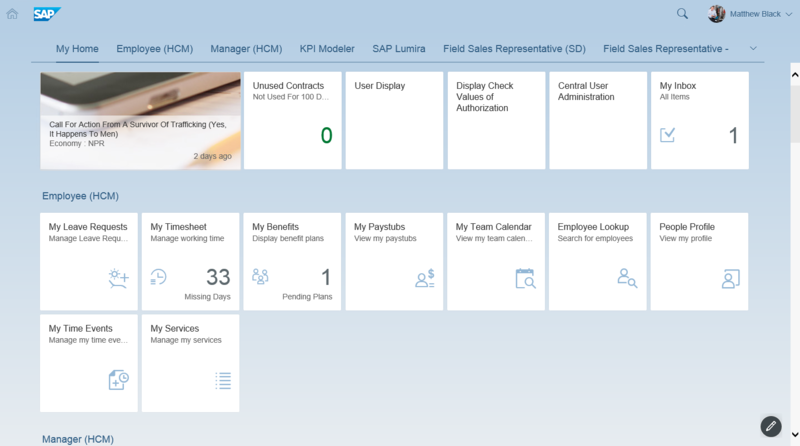 Good info with new SAP Fiori theme in 1.0 version. Very nice post. I was seeing your theme and i notice i the upper right corner the foto of the employee. Can you give me a hand how to accomplish without JAM. Also , I am not able to find the below parameters in the theme designer. I wonder how can I change the color of the text just above the various tile. For example the text ‘Employee (HCM) just above the tile ‘My Leave Requests’.